If you would like a NerdDeck representative to contact you in order to demonstrate our services, please fill out the form below. 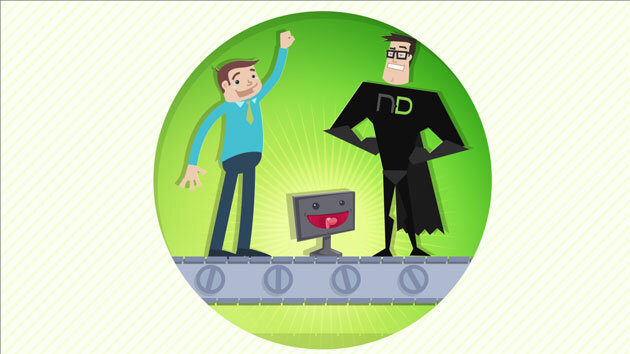 NerdDeck empowers your company with a PREMIUM REMOTE SUPPORT department. The future is in your hands! It looks like your browser does not support this video player. Having trouble? Click to view. "I was completely frustrated before I talked to Daniel. After I explained the problem, he took control of my computer and resolved the situation. He turned a bad situation into a pleasant experience. I could not be more happy with his service." "Absolutely wonderful, extremely helpful, knowledgeable and very willing to help. Your tech took the time to listen to me about my pc problem, and make sure I was satisfied with the repairs. I know who to contact for future issues." "When other technicians couldn't help me with my wireless network, James came through with flying colors getting everything running perfect. Your premium service is the best. Nice job, James!!!" "I try to be careful when downloading programs, but sometimes other programs are added that I didn't want. Seth cleaned my computer very quickly so it runs great again. Very happy with his service." "Benjamin was awesome. My past experience with computer savvy technicians was not fun as they were too technical, almost not human. Benjamin was personable, professional, yet funny and made what could have been miserable, quite fun." "I have honestly not found a more committed representative from any company I have dealt with. Jeff was patient and made sure I was satisfied with the end results." "I had the privilege with working with your tech, Chris. When I told him I might have virus in my PC, he was so thorough at making sure everything cleared up and now my computer works better than ever. I recommend this tech with the highest rating." "I thought Ryan was the best. All my questions were answered, the install went smoothly and I feel like I learned a lot. Ryan's service was greatly appreciated! Thank you." "Darrell went over and above helping me and was quite patient with me. I had a lot of questions to get my printer working on my home network. I recommend Darrell highly." "Very helpful. Donald got right down to the root of the problem and fixed my pc quickly. He is an awesome tech with very high skills and always so nice. You guys always do a great job." "Great communication and effort. John is a very effective team member. It was amazing to watch him work and I felt confident in his ability to fix everything!" "Oh, it's so nice to finally have someone to call for great computer services. Sometimes I'm at my wits end and it's nice to know when I call your premium help line, I get top notch service. Gives me a piece of mind about my computers!!!!!!!" "Very helpful to someone who is not quite as computer literate as others. Laurel took care of my immediate issue and offered help and suggestions on others. So friendly and professional. Thank you." "How lucky I was to connect with this technician again. I had connected with him a year and a half ago, and he did a GREAT recovery of my computer. James is knowledgeable and friendly. I would, and have, recommended him and his service to others. He did me good!" "In all honesty, this was my best Tech Support experience ever. David was friendly, knowledgeable and efficient and you can tell he likes his job. He checked all programs to find the problem and was professional and friendly while he worked. Thank you for offering premium services." "Al is always such a help to me. I get with him about once a month for solutions to any problems I might be facing and he continuously solves all my problems. I would recommend him to anyone for expert help in solving issues. He is a real asset." "Super-efficient and effective and, most importantly, painless for me. My computer was running slow and your tech found the solution and went the extra mile to make sure there were no other issues. Great service!"